The long, cold winters of the Finger Lakes region provide the ideal conditions for our authentic ice wine. We hand pick and press frozen grapes in frigid weather to yield a trickle of sweet nectar with a stunning array of possible fruit flavors depending on the vintage. 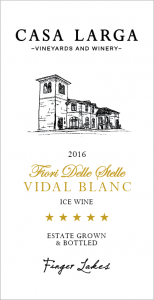 Our 2016 Fiori Vidal Blanc Ice Wine is a lusciously sweet explosion of honey and apricot aromas and flavors, following by a long satisfying finish. This exceptional wine is a labor of love and one of the world’s most highly awarded genuine ice wines. Viticulture notes. Vidal Blanc is a French-American white wine grape developed by Jean Louis Vidal in France in the 1930s. We trellis it high above the ground and train it in a downward, umbrella-like growth pattern. The vines are not thinned to help maintain high acidity. Grapes are left on the vine past normal harvest and into the winter. Vidal Blanc is winter-hardy, with thick skins that resist splitting. But the risks are still high. The longer grapes remain on the vine, the more exposed they are to weather damage, disease or consumption by animals. We produce our renowned Vidal Blanc Ice Wine using the authentic German Eiswein method. When the temperature dips below 18oF (8oC) for the first time, usually in December or early January, we hand pick and press the frozen grapes outdoors. Winemaking notes. The frozen grapes are pressed outdoors in a classic basket press, producing a sweet syrup which we ferment at cool temperatures with special yeast to maintain a bright nose and beautiful aromas. Fermentation proceeds very slowly, often persisting through the winter and into spring. Aging. Store at cool temperature (approx.55º), out of direct sunlight. As the wine ages in the bottle in your cellar, a tiny bit of air slowly percolates through the cork, which micro-oxygenates the wine, darkening the color slightly to yellow and eventually to gold. Its flavors also slowly age, from bright fruit flavors like citrus, peach and pineapple, toward “darker” flavors like raisins and honey. Tasting notes. Our Fiori Vidal Ice Wine is a lusciously sweet explosion of honey and apricot aromas and flavors, followed by a long, satisfying finish. Pairing suggestions. Rich appetizers like blue-veined cheeses and foie gras; paired with or drizzled over desserts such as Crème Brûlée, fruit and nut tarts and pies, and rich ice creams; or sipped all by itself in a small wine glass instead of dessert!